So I go to a lot of events with a lot of nerds, and it may surprise you to find out that dudes that watch ‘My Little Pony: Friendship is Magic’ is a thing. They are called ‘Bronies’. At first I was wondering if it was some kind of joke, but it is not. It turns out there are grown guys and girls that just like to watch the show, and support one of their own: Lauren Faust. So I decided what the heck it is on Netflix, and it will only take twenty-two minutes of my time to see what all the fuss is about. I have now watched two seasons of the show. The show’s basic premise is that a young pony named Twilight Sparkle is great at her studies and magic but has no friends and is lonely. 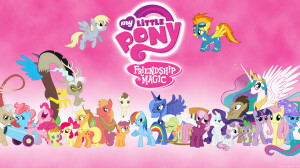 So her teacher and ruler of the land, Princess Celestia, sends her to Ponyville to make friends. Of course she does, and she and her friends go on adventures and learn life lessons. Now unlike the Bronies I am not totally enthralled with the show, but it is nice to watch something charming and sweet once in a while, and it is completely inoffensive. The show is smartly written, and has well formed characters which is amazing for a children’s show. 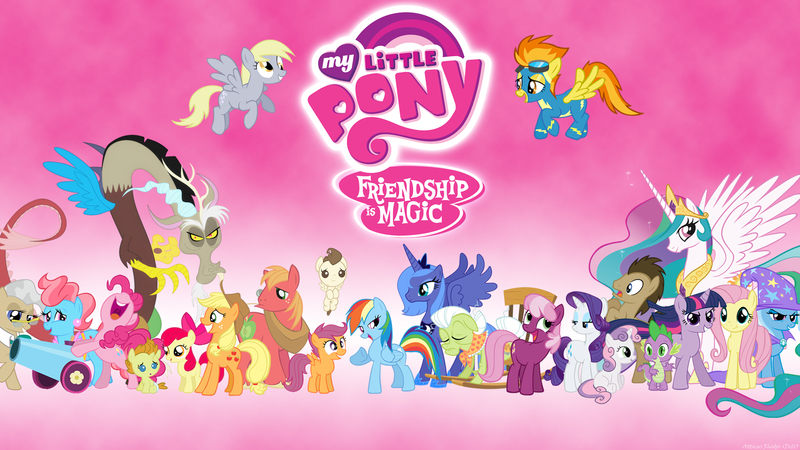 Most of that is due to the creator of this reboot, Lauren Faust. Lauren Faust got her start on the shows: The Power Puff Girls, and Foster’s Home for Imaginary Friends, and she is married to Craig McCracken who created both of the previous shows and Dexter’s Laboratory. These are all shows that geeks like myself have come to know and love, so some of us watching a cartoon about ponies due to their involvement seems less far fetched, and add in that the show is good and you get success. Now I am not saying that everyone should run out and watch this show, but if you are looking for something fun and will make you smile it might be worth a shot. You could do a lot worse. Unless you are allergic to pink because this show would probably kill you. Last night I re-watched one of my favorite movies. 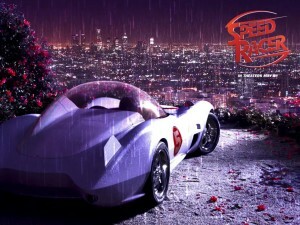 Please don’t judge me: Speed Racer. If you look at a lot of other reviews of this movie you will understand why people tend to give me dirty looks when I admit my love for this movie out loud, but I think it is a misunderstood masterpiece and I am going to try and explain why I feel this way. Speed Racer is a movie based off a Japanese Cartoon from the mid-sixty’s. Speed Racer is the name of the main character and all he wants to do is be the best race car driver in the whole world, and his dad runs Racer Motors, and builds his cars. The basic plot of this movie is that small independent race car companies are good and the big sponsors and builders are bad. Oscar worthy I know, but the plot is not what makes this movie great. It is the visuals, and the slavish devotion to the source material. This movie is like cotton candy for your eyes. There are shades of neon in this movie that you didn’t even know existed. And the way they make the cars move, is like how every six year old makes his Matchbox cars move: turning three-sixties, jumping, spinning, sliding around every corner. It is the stuff of every little boy’s dreams. Fantastic. The Wachowski’s also took a risk by turning a live action movie in to a cartoon with real people in it. 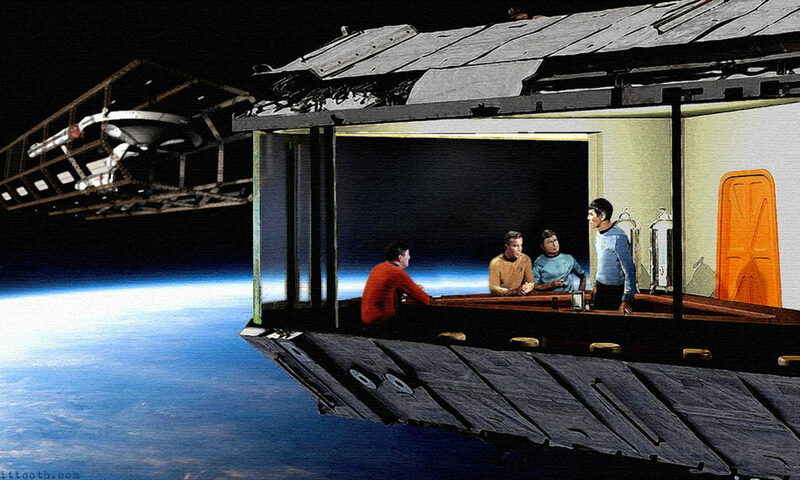 All the sets are animated, and so is the entire world around them. They made characters in the movie exactly as they are in the show which is amazing since the show was never that popular, and I don’t think any but a few of us got all the references. Like I said before in this movie is like cotton candy. I know this movie is pure visual sugar, and I can’t watch it all the time, but sometimes there is just nothing better then giving your eyes a treat. Even if you disagree with me about if this movie is good or not, I still think everyone should own this on Blu-Ray, not on DVD or streaming but Blu-Ray, because watching this movie puts your Hi-Def screen through its paces, and seeing those crazy colors pop and spin will make your jaw drop. I can’t wait for the 4K Ultra Hi-Def screens to come out, so I can melt my eyes out with this movie. So I was wondering what I was going to review this morning, and at first it was going to be the Super Bowl, but 50% of American’s watched it, so it is kind of unreviewable. Next up I was thinking I just watched The Breakfast Club for like the twentieth time, but hey it is a John Hughes classic and if you haven’t seen it shame on you. So thanks to my wife I also just watched the movie Pitch Perfect. 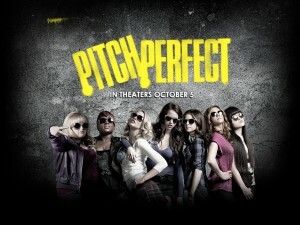 Pitch Perfect is about at rag-tag all girls a cappella glee club, The Barden Bellas, trying to win it all. Of course they have to out sing the all men group that is conveniently from the same school. The movie starts off with a loner, Beca (Anna Kendrick), who just likes to mix music and be alone, but gets dragged in to singing when another girl hears her sing in the shower. Then Beca’s new ideas put her at odds with the head of the group. I won’t spoil the end, but I am sure you can figure it out. The movie is tons of fun. It plays with glee club culture and makes it seem hip and cool. The main flaw that this movie has is that main character has crippling attachment issues that maker her push everyone that likes her away, and since they are all likable people it makes her unlikable for quite a bit of the movie, and that is always a dangerous choice. Thankfully Rebel Wilson’s role as “Fat Amy” keeps this film funny and light hearted. Rebel is becoming a standout in comedy these days and Pitch Perfect is another feather in her cap. Pitch Perfect is a good movie with a great supporting cast, and if you like glee clubs or college movies it is for sure something to put in your queue to watch. But if you haven’t seen Breakfast Club watch that first because John Hughes rocks. Do you Dare to Enter The Cave? 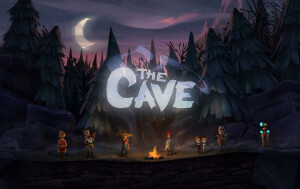 The Cave is a hybrid Platformer-Adventure game made by Double Fine Game Studios and published by Sega. If you are a fan of platforming games or adventure games, do yourself a favor and check this game out. The game is about seven adventures that are going to explore The Cave to find what their heart desires most. They all come from different walks of life: a Monk, an Adventure (think female Indiana Jones), a Hillbilly, a Scientist, Twins, a Knight, and a Time-Traveler. Their desires are varied and have twists that you will find out as you play the game. Double Fine is known for charming games and The Cave continues this tredition. The Cave itself provides the narration, and is very funny, and the explorers all have a fun look and feel even if what they desire is not altruistic. To play the game you jump up and down in a two-dimensional world, but unlike most platformers timing is rarely difficult. The challenge in this game are the puzzles. Trying to figure out what you need to do to proceed. Each character can hold one item at a time, and you only get three characters per play through, so you can count on having to have them team up to solve the problem. And the puzzles do a great job of being brain teasers but still having common sense based answers, and each play through is about three hours, so it is not as if you are devoting your life to this game, and you can save a quit anywhere. But really the draw here is the great writing and charm they crammed in to every corner of this game. If you like video games then this is something you should check out. If not, I still think you may want to give it a look. A few of my buddies, Andy, Shawn, Daniel, and I, got together to play the table-top RPG Shadowrun. For those that don’t know what a table-top RPG is, think D&D or geeks; actually both. So pretty much it is a bunch guys getting together, rolling dice, checking off spreadsheets, and following/creating a story with characters that they have created for this game. If your thinking that sounds awesome, it was. If your thinking, wow nerd overload, then this probably isn’t for you. Shadowrun takes place in the near future, but the twist is that at the end of the Mayan calender that magic as released in to the world, so now it is full of, Elves, Dwarves, and what-have-you. Also the future is now run by Mega Corporations that use governments as their pawns (so that part is pretty spot on), and ‘Runners’ are their mercenaries that carry out missions for them. So we as the players take the roles of these runners. Shadowrun was a little daunting at first, due to the sheer amount of customization you can do with your character. Every gun, item of clothing, in game knowledge, skills, and pretty much everything else can be tweaked, but once I got the basic stats down it became a little easier. We also took awhile just to figure out how to play the game, like hit an opponent, and how much damage you do and or take, and since the rule book is 348 pages long, you can see why it took awhile to get it all down. To be fair to the book, there are a lot of examples and short stories in it, so it is not all rules. But once it got going it was a lot of fun, and like most of these games the reason for that is mostly due to the company you are with. Having a good time will pizza and pop, and little trash talking. I hope we get to play again soon.